CLEARANCE STOCK - Still half price and now this new amazing offer..
Buy one, and get one FREE...Buy two, get two Free. That's right. We will match your purchase with the same number of free rolls. Get yours today! We have excess stock of the Black EternaBond RoofSeal - 50mm wide x 1.8M long. Great for the emergency repair when you are in the middle of nowhere. Keep it in your toolbox for up to 5 years. 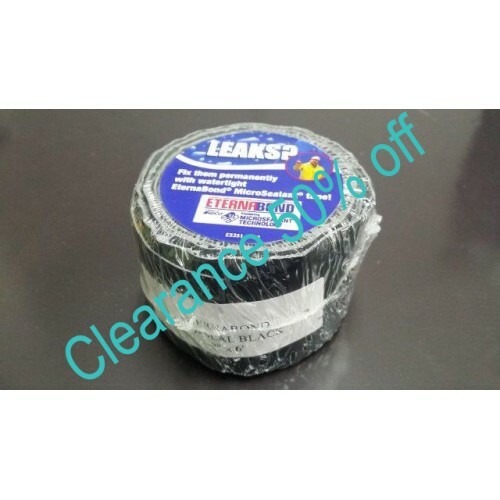 Perfect for the quick leak repair on your caravan, gutter, trough, shed roof, and more. We are offering this special pricing as we have excess stock. Special price for a limited time only and while stock lasts. Please be aware that the packaging can be difficult to remove due to the super high tack of the sealant.